The popular fruit litchi has some amazing health benefits to offer. The fruit – Litchi is a bright-coloured fruit. It has a whitish-grey pulp. However, it is available only for a limited period in a year – only in the summer season. It has a delicious flavour. 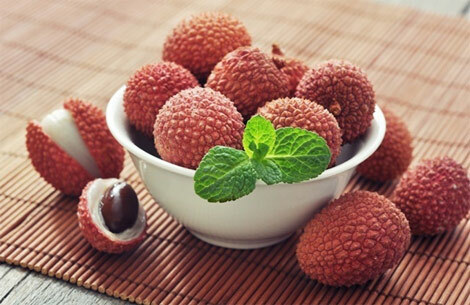 In brief, litchi is rich in nutrition, vitamin C, vitamin D, copper, phosphorus, magnesium, riboflavin, protein and water. It keeps your skin glowing and healthy. Litchi provides you with the hydration you need on hot summer days. Boosts immunity - The high vitamin C content in this super-fruit offers an immune system the fuel it needs. In a single serving, this fruit makes up for more than 100% of your daily requirements. It strengthens the white blood cells protecting it against foreign materials. Aids digestion – The contents of Litchi aids the digestion system. One serving of litchi can be helpful for treating the discomfort. Litchi’s rich dietary fibre content adds to the bulk in stools. Thus, it allows the bowel to pass through h the digestive tract easily and faster than usual while preventing constipation. It also induces the release of digestive enzymes in the body so that nutrients are absorbed more efficiently than usual. Controls blood pressure – Litchi is an ideal cure for hypertension. It is a rich source of potassium and low in terms of sodium. This helps in maintaining fluid balance in the body. Fluid balance is important for metabolic functions and hypertension as well. Potassium in litchis eases blood flow through the arteries, thereby reducing stress on the cardiovascular system. Boosts blood circulation – Litchi is rich in copper. Copper is just as important as iron. It boosts the production of red blood cells in your body. More RBCs in the body means improved blood circulation and better oxygenation of cells and organs. Benefits the skin – Oxidative stress in the body id the main cause of the quick ageing. Oxidative stress takes place due to free radicals. This results in the appearance of blemishes, fine lines and wrinkles. High vitamin C content in litchis can be helpful in reducing the negative effects of free radicals while slowing down ageing. Aids weight loss - Litchi is a good source of dietary fibres. Dietary fibres play an important role in inducing weight loss. Litchi also has a high water content with negligible fat and is extremely low in calories as well. This makes it the perfect fruit for weight loss. Strengthens bones – Litchi is rich in nutrients like magnesium, copper, phosphorus, iron and manganese which play an important role in calcium absorption. When the will be able to absorb calcium in a more efficient way, it will add to the strength and health of your bones. While enumerating the health benefits of Litchi, it is also worthwhile here to add a word of caution - litchi has high sugar content. So it may not be the perfect fruit for diabetics. It is also taken under the hot-foods group which is why there is a need to be careful about portions. It may result in a fever, bleeding nose, sore throat and irritated membranes. • Yummy, healthy masala buttermilk - so ideal for scorching summer!